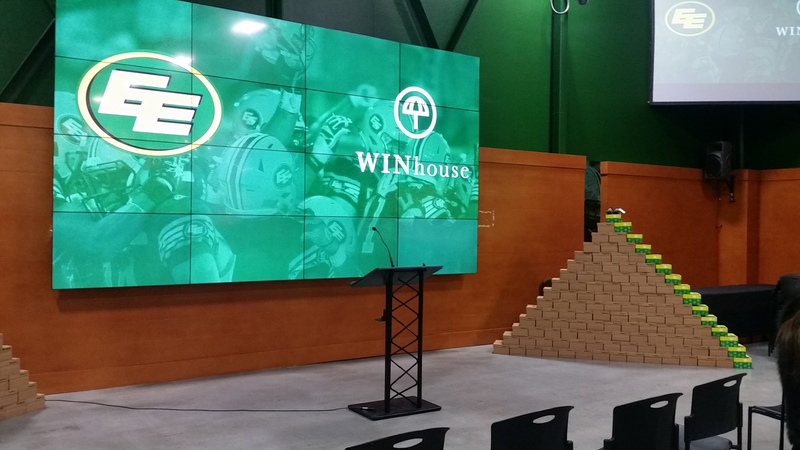 Eskimos President and CEO Len Rhodes, in partnership with Reebok, donated 254 pairs of shoes to WIN House, also known as the Edmonton Women’s Shelter. “Ending domestic violence is one of my personal priorities,” said Len Rhodes, President and CEO of the Edmonton Eskimos. “Having the unfortunate experience of growing up in a household where domestic violence was commonplace, I have made a personal commitment to end this cycle of violence against women. Today’s donation provides enough footwear to allow the women and children the shelter serves over the next year to focus on self-healing and not worry about basic necessities. Throughout Edmonton and area, for nearly five decades, WIN House has given women and children of all ages and cultures a safe place to flee – 24-hours-a-day, 365-days-a-year. From passionate professionals and volunteers, to dedicated donors and champions of the cause, WIN House is committed to providing safety, support, relief and resources for abuse victims. “Sustainability at WIN House is achieved not only from the operational dollars and cents we receive, but from incredible and generous in-kind donations and services that come our way.” says Tess Gordey, Executive Director of WIN House. The annual donation is one of several initiatives the Green and Gold support to end violence against women and children. The Edmonton Eskimos partner with the Alberta Council of Women’s Shelters on the Leading Change program. Through the program, select players underwent three days of intensive training in gender-based violence prevention and present the messages to young athletes, coaches and students at community events and schools.